Dr Michelle Strydom trained and qualified as a medical doctor in South Africa and her desire is to practice medicine for the glory of God and leave behind a legacy of His love. 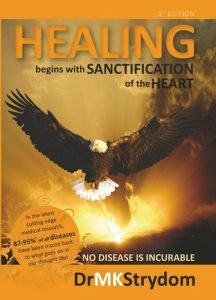 She authored Healing Begins with Sanctifcation of the Heart and uncovers the foundation of disease by providing insight, from both a medical and Biblical perspective, into the spiritual, psychological and physical mechanisms that produce ill health. Her teaching demonstrates how latest medical research confirms Biblical principles of health and disease and reveals how coming back in line with His Word through repentance and sanctification helps us to overcome illness, be healed and made whole. Michelle desires to practice medicine for the glory of the Lord and to make an impact that leaves a legacy of His love because she believes that the love of God is the best medicine. Apart from working as a medical doctor, God has called her into full-time ministry.